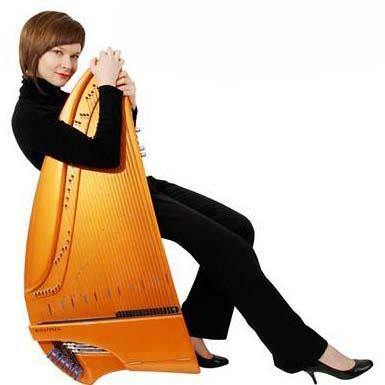 Olga Shishkina (born 1985, Leningrad) is a Russian gusli and kantele musician, currently residing in Helsinki, Finland. As a gusli player, Olga is known for her innovative approach to the instrument such as creating new playing techniques and expanding the guesli repertoire. 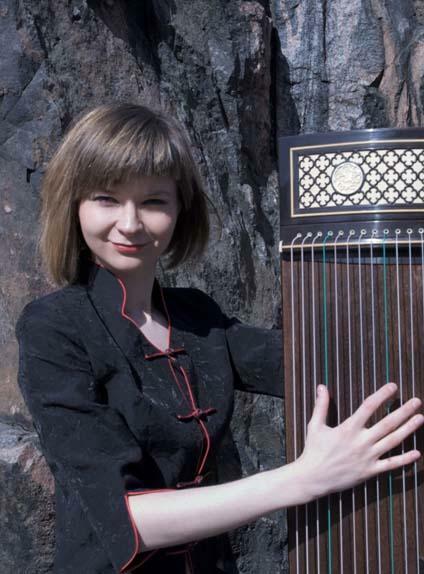 Shishkina has experimented with various music styles and and during the past years she has been devoting her time to the electric kantele to develop its use in improvisational jazz music. Her style was also influenced by many different instruments and musical genres. Video above: Olga Shishkina plays 'Sakura' by the Japanese composer Yuqujiro Yocoh on gusli. Yuqujiro Yocoh's composition 'Sakura: Theme and Variations, which is based on a famous traditional Japanese folk song, depicts the spring time in Japan when the cherry blossoms, known as Sakura, begin to bloom. Olga Shishkina plays her own interpretation of 'Sakura'. When she was about 17 she heard it on the radio played by John Williams and she immediately got overwhelmed and already got the idea of making a transcription. Olga: "Since I didn't really know what piece that was, and who actually had composed it, I called my boyfriend, a classical guitarist, and asked him. It appeared to be Yuqujiro Yocoh." Japanese composer Yuquijiro Yocoh, born in 1925 in the city of Hita, Japan, had a passion for music and left the Keijoh Dental College in favour of studying guitar. As a result, he became a self-taught guitar player and a well-known composer. His theme and variations of the Japanese folk song 'Sakura' is his most famous work. It has been played and recorded by countless guitarists worldwide. Olga: "When I made my own transcription for gusli, I inserted many new elements in the piece, like I usually do, when I arrange or transcribe music. I am quite innovative. The most difficult thing was to find suitable techniques that could express the Japanese mood, recreating something similar to koto sounds but at the same time not losing the characteristic sound of gusli. Gusli has a very strong, loud sound but in this piece I was searching for something really intimate, zen-like effect. I used a lot of pizzicato, a combination of pizzicato with plectrum, con sordino sounds, playing in different parts of the instrument. I wrote the transcription in December 2010 and performed it for the first time in January 2011 in Japan." Olga Shishkina: "I wanted to express myself as a multi-instrumentalist"
Olga Shishkina: "Enrich your musicianship by studying other instruments, musical genres and cultures. Always search for improvement.” After playing for 20 years the Russian gusli, Olga Shishkina has developed into a internationally active gusli artist who has performed from Japan to the USA, both solo, and as a chamber musician and with symphony orchestras. She has recorded a solo CD “Con Brillo” and has written a lot of arrangements and transcriptions for gusli. She has performed on such venues as Grand and Small Philharmonic halls in St.Petersburg, His Majesty’s Theatre (Aberdeen) and the Royal Swedish Opera House. Gusli is the oldest Russian string instrument that belongs to the large zither family and has relatives around the world, like Finnish kantele, Lithuanian kankles, Latvian kokle, Estonian kannel. Its distant relatives are Chinese guzheng and Japanese koto. Up to these days gusli exists in 3 types: a wing-shaped gusli, a helmet-shaped type and so called klavier-gusli or rectangular gusli that includes keyboard and chromatic gusli. 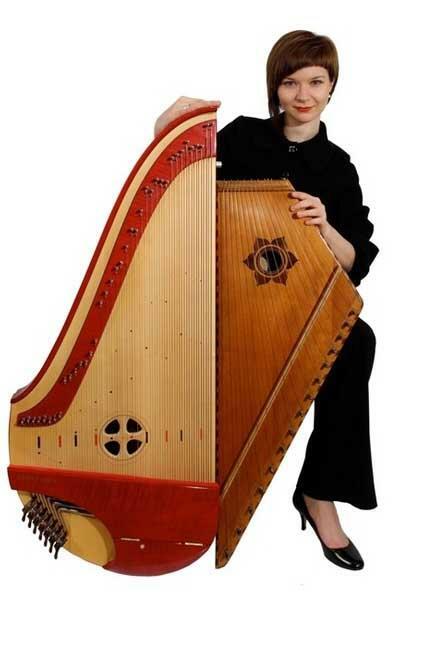 Olga Shishkina with two of her instruments: Finnish concert kantele (left) and Russian gusli (at the right). While studying gusli at the Korsakov Conservatory, 5 years in total, Olga also did secondary studies in piano, organ and orchestra conducting. At the conservatory she studied piano for 4 years with Alexandr Vasiliev, a very famous musician. Studying the piano at a Russian conservatory is obgligatory. She also studied organ for 3 years with the honoured artist of Russia, Tatjana Tchausova. In 2008 Olga graduated from the Rimsky-Korsakov Conservatory with the highest honours. In the same year she decided to go to Finland to study in Helsinki. Olga:"I came to Finland, because I needed to find my own self as a musician and I wanted to find a better way to express myself, which eventually I found through jazz." At the age of 23 Olga started studying kantele with Ritva Koistinen, who is a renowned Finnish kantele artist and the founder of soloist kantele education at Sibelius Academy. Koistinen has been teaching there since 1987, and was a lecturer of kantele music from 1995. Olga: " I think she is a very unique Finnish kantele artist who deeply understands the nature of kantele sound. This is something really special and something I admire a lot. The kantele is a reallly sensitive instrument with a very delicate sound, and you have to be very careful to produce the sounds, there are so many nuances that you have to bear in mind." 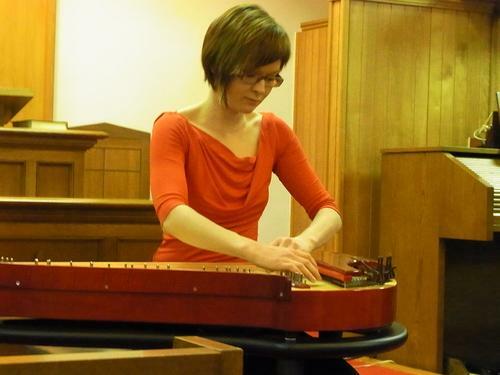 Olga studied concert kantele, which is an acoustic instrument and at the same time she mastered the electric kantele. She says: "I had never played kantele before. I went to study at Sibelius Academy in Helsinki, and I had to do my Master's Degree in 4 years. That was quite a challenge, but I succeeded. The kantele has a totally different technique, it is played by plucking the strings up, without a plectrum, like playing a harp. So the technique is entirely different. On gusli you play only with one hand by strumming the strings with a plectrum." Since 2008 Olga has been living, studying and working in Helsinki. During last 5 years she has been very busy both as a gusli player and also with kantele , her new instrument. She performed with Lapland chamber orchestra, was invited to record as a gusli player on Pepe Deluxe “Queen of the wave” album and as a kantele player on Saara Aalto’s record “Angels”. Since 2008 Olga has been living, studying and working in Helsinki. Olga also started composing and was recently involved in a project of the Helsinki theatre, the European Theatre Collective (ETC), established in 2007. ETC is a cutting-edge theatre ensemble based in Helsinki. ETC is at the forefront of an expanding international network of both foreign theatre artists who have immigrated to Finland and Finnish theatre artists who have received their education abroad. While studying kantele in Helsinki, Olga also studied jazz piano, following her interest in jazz, as a secondary instrument with Jussi Fredriksson. Studying jazz piano helped her to find new ways of expression, since she started to try out different jazz pieces on the electric kantele. I found out that it was possible to perform jazz on the electric kantele." In 2009 she started a duo project, called "Off limits" with one of the most respected Finnish guitarists Timo Kämäräinen, where Olga played the electric kantele. It has been the very first time that the electric kantele was used in a jazz context. In 2011 followed a unique concert together with Kämäräinen. Olga: "We played jazz songs that had never been played before in this country." "My mother was my first teacher"
Olga Shishkina (28) is an outstanding, original musician, who is standing at the doorstep of international breakthrough. She started playing gusli in Russia at the age of 8. Inventive and curious, she is musically very broad-minded and gifted, and always transcends herself by dsicovering new instruments and new styles of playing gusli or kantele. She is one of the few talented, young rising stars, that 'absorbs' music, just by listening to it ore by trying out a new instrument. Durig the past 28 years of her life Olga learned to play 9 instruments, which is quite exceptional for a relatively young musician. Apart from the oboe, which she only studied one year in her childhood, she learned to master the piano, organ, gusli, the traditional guzheng from China, the balalayka, electric kantele, acoustic kantele, chromatic gusli and the guitar. Although Olga wasn't born into an exceptionally musical family, her mother used to play the piano and was her first teacher on the gusli. Olga remembers: "I was born in Leningrad, and my mother, who studied at the music school, played the piano and taught me musuc basics in the beginning. She was my first teacher, the one who introduced me to music." "At first I started to study oboe, for about a year or so, but then my parents got the idea of finding some instrument a little more exotic. Then I went to the one and only music school in Leningrad, at 8, where I could study gusli. It was the Andreev Music School named afer the famous Russian balalayka player Vassily Andreev. He is also known for modernizing all the Russian instruments for orchestras. I studied gusli there for 7 years. Subsequently, while I was finishing highschool, I had private lessons with three differents teachers for 3 years, from the age of 15 till 18. I studied gusli, music theory and orchestra conducting. Then at 18 I went to study at St. Petersburg State Rimsky Korsakov Conservatory, on an exceptionla basis, because I had only followed music claases at the Andreev Music School, but I didn't go to the Music College, which normally students go to after having been at the Music School. But I was admitted at the Conservatory and I learned a lot." Before studying at the Korsakov Conservatory, Olga participated in three iternational Andreev competitions for young folk instrument players, the first one at the age of 10. Although she performed quite good and in one competition she was leading the first two rounds, she didnit win, because the actual prizxe-winners, who even were not that advanced, had more experience. Nevertheless for young Olga it was a great experience to taske part in the copetitions and it opened the doors for her to stasrt her musical career. Gradually she got to know the gusli better and better and started experimenting with it. Olga:"The gusli is an amazing instrument, althoug it is still a little bit limited compared to other instruments. You have to learn as lot from other traditions and instruments to play the gusli well; on the other hand it is also a very rich instrument. It has a lot of opportunities in terms of sounds and sound effects." "Gusli is an extension of my soul." "Gusli is the instrument that I have been playing the longest. It is an extension of my soul. The instriument has a very powerful and very personal way of communicating with me. And of course it is a Russian instrument and I am Russian myself, so I feel there is a very deep connection with it. I believe that during all these years of gusli playing, I have been albe to play to most sensitive and gentle naunces in music. I can get very deep sounds out of the instrument. Gusli is the instrument where my roots are, of course." 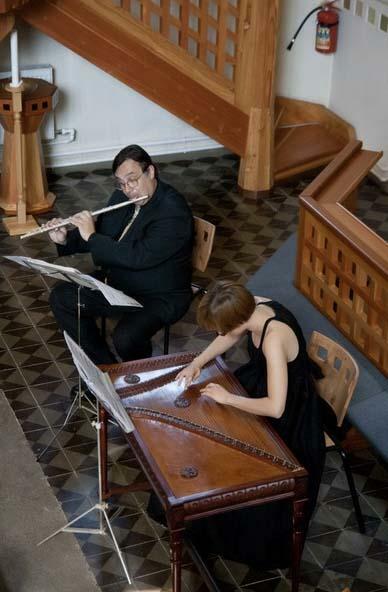 Olga Shishkina performing a duet with the famous Russian baroque flutist Aleksander Kiskachi. the most serious competition ever. It was called 'The All Russian Competition for professional folk instrument artists'. I participated three times in this competition. At the age of 16 I won a second prize in one of these competitions and become the youngest prize-winner in the competition's history." Olga Shishkina was also the laureate of the International Andreev Competition for young folk instrument players, in 1996, 1998, and 2000, in St. Petersburg. Olga continues: "Another person who has been very important for Olga's career, was Tatjana Barkanova, my very first gusli official gusli teacher. I was eight when I met her at the Music School in Leningrad. She was educated as an accordionist. She had followed special private lessons in gusli with a very famous gusli teacher Valeri Tichov, for half a year. So didn't play gusli herself that well, but she understood the nature of the instrument. For me, she was the one who changed the way of playing gusli, I think. She passed on the tradition of Valeri Tichov to all the players. That was very important. It was a very free style, like opening yourself as a musician. She taught me to enjoy when I was playing. That was very important. And also Aleksander Kiskachi, has had a great influence on my career, he is one of the most famous baroque flute players in Russia. I have been collaborating with him since 2004, so we work together 10 years now. Kiskachi had the idea or playing together with a unique Russian instrument and he encouraged me to order an old chromatic gusli, which was a forgotten instrument in Russia. It has been the most favourite instrument at the Russian court, roughly from 1730s until 1850s, so for one century is has been a very important instrument. Kiskachi wanted me to learn how to play it. That was a great challenge. We started to play the old forgotten music of the Russian imperial court. To play forgotten music, is very unique of course. Last year I played a concert with Kiskachi in Switzerland." At the age of 16 Olga started to travel a lot with orchestra and played concerts in other countries. My study at the Korsakov Conservatory was very helpful for my career, although less challeging than the Sibelius Academy in Helsinki. "At the Korsakov Consdervatory the repertoire consisted mainly of work from the Soviet times. Those were the arrangements of old Russian folk tunes It was rather conservatice, rather old-fashioned. I studied there for five years. Still, I learned a lot there. It was a unique chance for a gusli player to start at the Korsakov Academy. At that time I was also studying piano and organ. I studied piano with the famous Alexandr Vasileev. Eventually I wanted to go to Finland to learn to play the kantele." During her musical career Olga been awarded many grants, for example the special grant from the Russian Ministry of Culture and the scholarship form the New Names Foundation directed by Vladimir Spivakov. In 2001 she was awarded the title 'Hope of Russia' and also got the award from the Worldwide Club of Petersburgers. In 2002 Ogla performed at the Aberdeen International Youth Festival, at the age of 17. Olga: "The Festival was a marvellous experience, I did a lot of concerts there, playing with local pianists, sometimes I had even two concerts a day in the most incredible venues, like churches, museums and even in Balmoral Castle, near Aberdeen. Scotland was one of the places I enjoyed playing the most, the response of audience was incredibly warm all the time and the concerts were a big success." Currently, in Helsinki she continues her career gradually more playing the electric kantele, which is fascinating her a lot. She performs a lot of musical pieces while improvising and playing with other musicians. She emphasizes that having studied the piano for a number of years, means an advantage to become a kantele player. Olga explains: "Those who have a piano background can easily pick up the basics of harp technique, the Finnish kantele beloging to the family of harp instruments. Piano skills are very helpful when mastering other instruments as well. I my case my long experience of a pianist helped me immensely in kantele playing. The two instruments really have a lot in common."